Fits both votive and tealight candles. One palm wax votive candle is included. 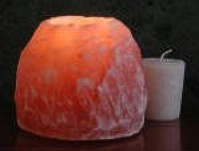 The Himalayan Salt Crystal Candleholder is perfect for mood lighting, adding the perfect ambience to bedrooms, bathrooms or anywhere. This size fits both votive and tealight candles. It is 3 1/2" high and 2.5 lbs. One palm wax votive candle is included.